Ethnobotanic: The apical meristem, young flower stalks, flowers, and tender immature pods were eaten by many tribes in southern California including the Tubatulabal, Cahuilla, Luiseno, Diegueno, Kawaiisu, and Western Shoshone and are still gathered today. According to the Kawaiisu, traditionally in the early spring, the apical meristem or "heart" was removed with the aid of an oak or a juniper shaft. It was then roasted in a pit for a lengthy period. While green and tender the flower stalk that grows out of the apical meristem was cut or broken off by hand. These stalks were cut into sections and roasted in fire or in ashes and coals. It is reputed to have a sweet taste. The flowers are edible and can be boiled and eaten. The Diegueno tribe harvested the flowers before they opened and boiled them twice to remove the bitterness before eating. 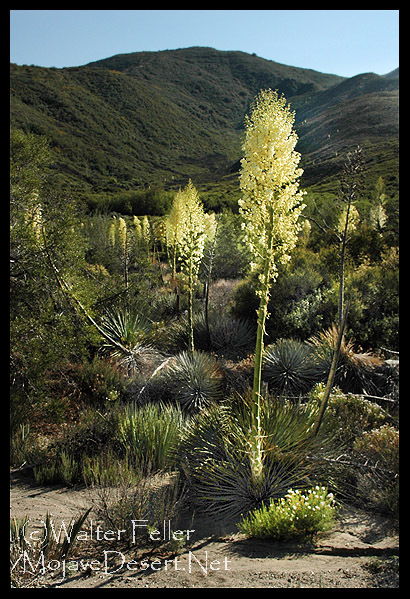 Chaparral yucca was also an important fiber plant. The Diegueno and Cahuilla used the fibers for sandals while the Chumash and the Gabrielino used it for fishing line. Whole or split yucca leaves were also utilized for rough tying of bundles of firewood, house frames, and for basketry. To retrieve and prepare the fibers, the leaves were immersed in water until the epidermal sheath and the connecting round tissue rotted away. The leaves may also have been pounded with a wooden mallet to facilitate the process. The fibers are then buried in mud to whiten them, washed and combed. Wildlife: The seeds and fruits are eaten by the antelope ground squirrel and hummingbirds consume the nectar. General: Agave Family (Agavaceae). This shrub is simple and acaulescent with no evident trunk. The leaves are slender, stiff and gray-green. They are 3-8 dm long and radiate from a central base and have needle-like tips. The plant has a single flower stalk, which is covered with fragrant, creamy white flowers. Night-flying moths pollinate the flowers. The fruit is a capsule containing numerous black seeds. After fruiting the plant dies. Some plants reproduce vegetatively through offsets. This plant is found in chaparral, coastal sage scrub, creosote bush scrub and the desert at elevations below 2500 m. It grows in southern California, northwestern Arizona, and Baja, California. Seeds: Plant the seeds in the fall in deep, one-gallon pots in well-drained soil. Lay the seeds on top of the soil and sprinkle soil over the seeds until they are covered. Then cover the soil with one quarter-inch of gravel. Keep the pots damp through the first year. The plants need sharp drainage and space. Plant the young seedling the following fall outside. This yucca needs full sun, excellent drainage, and is intolerant of frequent summer water. It can endure cold temperatures to about 10 degrees F.
Bean L.J. & K.S. Saubel. 1972. Temalpakh: Cahuilla Indian knowledge and usage of plants. Malki Museum Press, Morongo Indian Reservation, Banning, California. Hedges, K. & C. Beresford. 1986. Santa Ysabel ethnobotany. San Diego Museum of Man Ethnic Technology Notes No. 20. San Diego Museum of Man, San Diego, California. Kroeber, A.L. 1909. Notes on Shoshonean dialects of Southern California. University of California Publications in American Archaeology and Ethnology 8(5):235-269. Martin, A.C., H.S. Zim, & A.L. Nelson. 1951. American wildlife and plants: A guide to wildlife food habits. Dover Publications, New York, New York. Mathewson, M.S. 1985. Threads of life: Cordage and other fibers of the California tribes. Unpublished Senior Thesis. Department of Anthropology. University of California, Santa Cruz. McKinney, K.K. & J.C. Hickman 1993. Yucca. Page 1210 IN: The Jepson manual: Higher plants of California. J.C. Hickman (ed.). University of California Press, Berkeley. Mielke, J. 1993. Native plants for southwestern landscapes. University of Texas Press, Austin, Texas. Voegelin, E.W. 1938. Tubatulabal ethnography. Anthropological Records 2(1):1-90. Zigmond, M.L. 1981. Kawaiisu ethnobotany. University of Utah Press, Salt Lake City, Utah.